Everyone loves an ice cream cone. Click here to view my cones gallery for proof and enjoy some of the photos I've taken over the years. Great fun! According to statistics, vanilla ice cream is the most popular ice cream in the world. From the USA across to China, its appeal is universal. When I first discovered this fact I was determined to understand why. I read up on vanilla, the pod, the bean, its history etc and in the cold light of day the facts just didn't make it seem a likely candidate for such popularity. 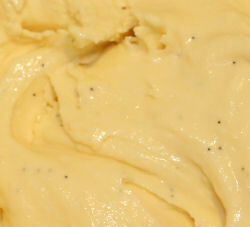 For example .... the vanilla bean is not even a fruit - it comes from a plant, a climbing orchid; vanilla's official classification is that of a spice; visually the vanilla bean looks unappealing; long, thin and green when picked; it then shrivels and turns black; when vanilla pods are first picked they have no fragrance - only after they're dried and cured does the fragrance appear. If someone asked me to make ice cream with a dark, long, thin pod from a climbing orchid, I'm not sure I'd have too much enthusiasm! So what's the secret? Only when I first made my own homemade vanilla ice cream did I truly understand - it's the TASTE .... sweet with a hint of spice, fruity and yet floral - it's simply unique. Vanilla leaves a 'footprint' in the taste memory that is a 'hard act to follow'. Once you've made your ice cream there are lots of ways to serve it - from 1 or 2 scoops in a cone to a delicious sundae at the other end of the scale. Click here for some great ideas. The fun of ice cream knows no bounds.